Thanks to the Series 1 and Series 2, the Apple Watch saw its best-ever performance in the December quarter, according to research estimates shared on Thursday —even if Apple was eclipsed in the wearables market by the likes of Xiaomi. Apple shipped 4.6 million Watches in the quarter, up from 4.1 million a year ago, according to IDC data. Apple has yet to publish any official Watch sales numbers, and in its most recent financial call claimed only that the device set new records in "both units and revenue," straining production capacity. "The lower entry price point and the inclusion of GPS on the Series 2 along with a completely revamped user interface have helped the company grow its presence," IDC commented. 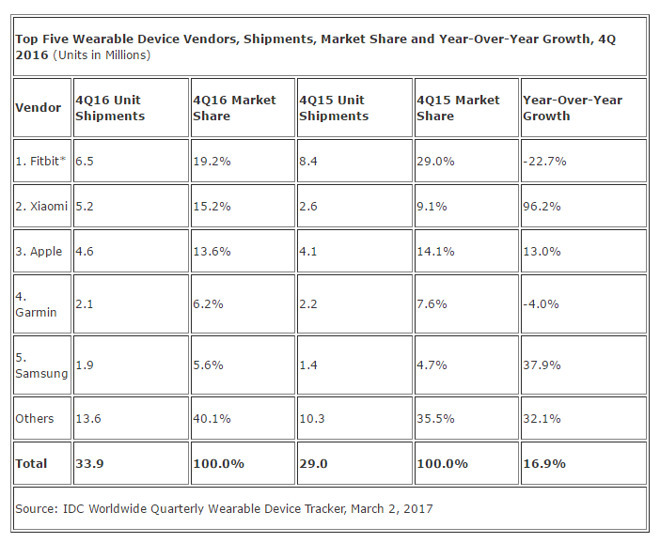 "Apple is one of the few companies that has been able to quickly refocus its watch to gain traction in the consumer market and has also been leading the charge on introducing the smartwatch category to the commercial segment." 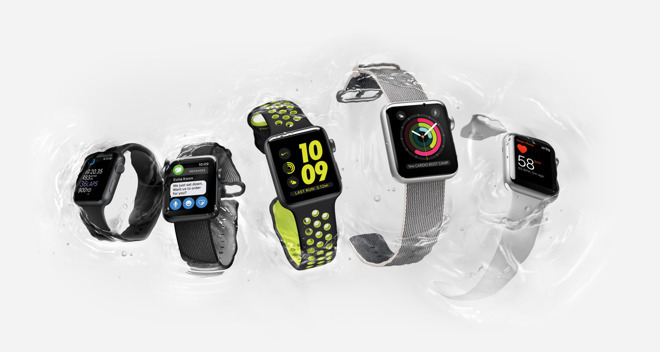 Apple swung more heavily towards the fitness market with the Series 2, adding GPS and full waterproofing —features often reserved for high-end trackers by the likes of Garmin. It even put out a special Nike+ edition, featuring unique Sport Bands and preloaded software. The Series 1, meanwhile, brought the Watch's base price down to $269, while still offering an upgraded processor. Apple's global marketshare nevertheless fell from 14.1 percent to 13.6 percent in the last quarter, IDC said. This was linked to "relentless" growth by Xiaomi, which leapt from 2.6 million units to 5.2 million, giving it a 15.2 percent share. Fitbit retained overall control of wearables, but plummeted from 8.4 million units to just 6.5, bringing its share down from 29 percent to 19.2. Long focused exclusively on fitness, the company is hoping to enter the smartwatch arena to regain an edge. Apple is thought to be at work on a third-generation Watch model, which could adopt new touch technology and possibly LTE support. The latter might let people use the device completely independently of an iPhone, solving one of the biggest complaints so far.